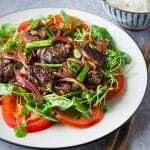 Braised sardines with tomatoes and green tea is an excellent dish to eat with rice. The sardines are braised until tender and absorb all the seasonings. This is one of the popular methods to cook fish in Vietnam. 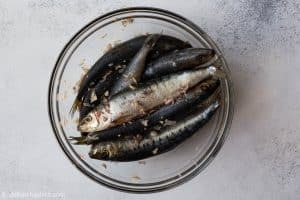 Sardines are an excellent source of many nutrients, including those that are becoming harder and harder to get in our modern diets such as calcium and omega-3 fatty acids. When I cut as much dairy out of my diet as possible, I started to eat sardines more often to obtain calcium. In addition, sardines are super safe to eat since they are low in the food chain which means they are very low in mercury and other contaminants. 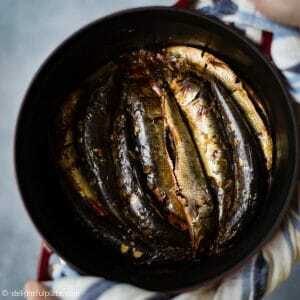 In Vietnam, small and oily types of fish as sardines are part of weekly meal rotations in many households. They are often braised until both the flesh and small bones are tender and edible. We generally call braised fish/caramelized fish “ca kho“. I guess sardines don’t get a lot of love in Western countries because of their strong fishy taste. 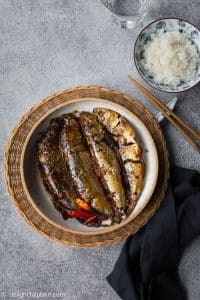 With the Vietnamese cooking method described below, the sardines will become pleasantly tasty. An interesting way Northern Vietnamese cooks use to get rid of the fish smell is to braise it with green tea or fresh tea leaves. I cannot find fresh tea leaves here so I use green tea to make braised sardines. 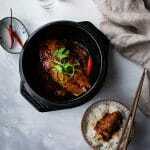 Using a lot of aromatics and spices such as shallots, garlic, ginger, galangal, birds-eye chili, and pepper also helps reduce the strong fishy taste. Sardines also go really well with tomatoes. I was a picky eater as a kid, but for some reason, I loved canned sardines in tomato sauce. My mom always had several cans of sardines in tomato sauce on hand in case I didn’t like the dinner. 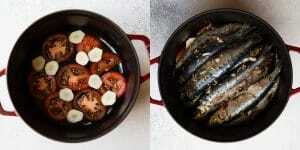 So, it’s been ingrained in my brain that sardines and tomatoes are a perfect combination. 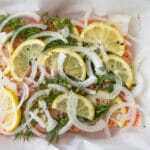 The cooking method is actually the same as how I cook the Vietnamese-style caramelized salmon. After almost an hour of braising, the sardines are tender, savory with some sweetness and heat. Step-by-step instructions and photos are all in the recipe card as usual. It is indeed a lot of work to run a blog. We sometimes feel exhausted creating contents for the blog while working full-time. We also don’t know where all these things are going to take us, but we enjoy it and are committed to creating better contents and taking more beautiful photos. 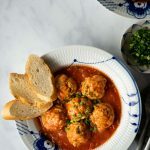 There is no doubt that the most rewarding thing we’ve received from blogging is the positive feedback from readers who try our recipes. Words can’t describe how much we appreciate your support. We hope you will continue cooking with Delightful Plate :). In a small saucepan, add sugar and 2 tablespoons of water. Bring to a boil. Lower the heat to medium, continue to simmer. You will see a lot of bubbles on the surface. The mixture will then turn from clear to yellow, and get darker as you simmer it. When it has a honey color, reduce the heat slightly. Keep watching closely, until it has a slightly dark caramel color, turn off the heat and carefully add 2 tablespoons of water. Swirl the saucepan to combine and remove it from the stove. Set aside. Put the tea bags in the hot water, steep for about 5 minutes and then discard the tea bags. In a mixing bowl, add sardines, salt, shallots and plenty of black pepper. Mix well and set aside for 10 minutes. Scatter the tomato slices and ginger/galangal slices at the bottom of a pot or braising pan. Place the sardines on top. It's likely you cannot fit all the sardines in one layer. If so place one layer of tomatoes and ginger/galangal, then one layer of fish, repeat one layer of tomatoes and ginger/galangal and then the remaining fish on top. Add birds-eye chili. Add the tea to the pot. The liquid should be just about enough to cover the fish. If the tea is not sufficient, add a little more hot water. Bring everything to a boil. Skim off any foam. Add caramel sauce and fish sauce, then reduce heat to a simmer. Simmer partially uncovered for about 40-45 minutes until there is a little sauce left at the bottom. If the liquid reduces too rapidly while simmering, add a little more hot water. Taste and adjust to your liking with more fish sauce and black pepper if needed. 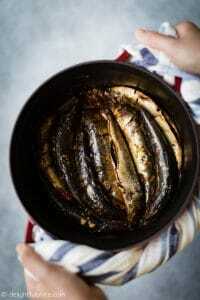 Place sardines in a serving plate and serve hot with rice.